A true photographic image of Joseph Smith Jr.: 6. Carter photograph vs. my photo. 6. Carter photograph vs. my photo. There has been some question as to whether my Joseph Smith photo is from a "Carter Glass Print Negative". I wanted to point out some of the subtle differences to the blog readers. The Carter print show Joseph with a distance between his ear on the left side and his collar. My photo shows an intersection between the ear and collar. How could you paint this onto a negative? It is very apparent that the Carter print is from the RLDS painting, I believe most would agree with this concept. The RLDS painting is a beautiful work and is quite accurate to the photo but still there are many differences. 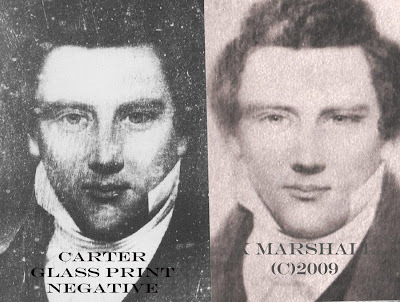 The Carter print shows Joseph with a very straight tapered nose, an enhanced version of my photo shows that his nose was crooked and had possibly been broken. The eyes....I think they tell everything. 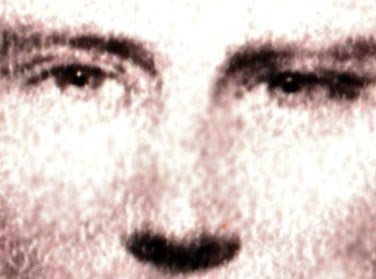 Carter's photograph shows Joseph's eyes even in size and the one on the right side is upturned slightly. My photo shows a lower eye top lid on the right side. While meeting with Bill Slaughter from the LDS Church History Library, I asked him if he had ever seen Joseph with a crooked nose, he said that he had not but wanted to go back and review more information. A point that was brought up during the photo examination was that if the photograph had been derived from a one dimensional painting negative the entire image of Joseph would have been in focus. Instead the focus is primarily on his face and eyes, just a daguerreotype photo would have been taken in the 1840's. Saw the ABC4 News program. It was so cool to see you on the tube--you looked great! The photo looked great! So exciting I can hardly stand it. Wow. Congratulations! Just wanted to leave a small piece of business advice. When the church offers you money for the original (and they will), make sure you don't ever sign away your rights to royalties made from the prints. They may tell you they want to own it outright but that'd be a big mistake. If it were me, I'd even take less up front for a royalty deal. ...and maybe you don't see yourself as a greedy person but it's not about greed. It's about protecting yourself and not letting anyone take advantage of you for their own gain. You may already know all this but I'd be sick to my stomach if I heard you were taken advantage of. when the glass negative and your alleged photo are side by side, the poses look too similar for one to not be a copy of the other. the shirt collars are identical the shading makes the eyes look different, but anyone can make eyes appear deeper and eyebrows look slightly different with mere shading and tint options in photo shop. i personally believe they are both from the same source. 5. Don't miss ABC4 in Utah at 10:00 P.M.